This Sunday, the Sai Kulwant hall was packed to capacity as usual and the adjoining pathways welled with people eager to catch a glimpse of the sunshine of their lives. Swami arrived at 9:05 AM and moved slowly in the chair. Completing the darshan rounds, Swami moved to the portico. He enquired from Prof. Anil Kumar about his recordings at the Radio Sai Global Harmony studios. Swami refers to it as the "Bangalore Radio" for He first heard it at Bangalore. 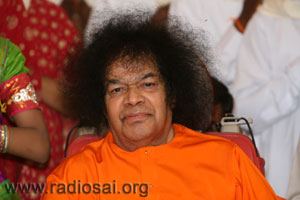 Today, He has His personal digital radio set at His residence, the Yajur Mandir and is a keen listener of Radio Sai. The only channel to which the Lord subscribes is the one that carries His message round the clock, in its pure and unsullied form. 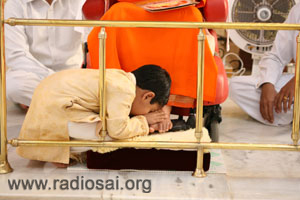 Swami then began a second darshan round! He went through the entire ladies side and via the central marble block into the gents’ side too. Swami went about collecting letters and blessing all. He sat outside listening to the bhajans and this bonus darshan only brought more joy. Then He moved into the bhajan hall for the conclusion of the bhajans and aarthi. 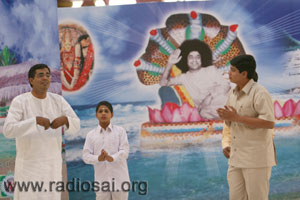 After the bhajans, Swami began speaking with the students there. He asked a person whether he was listening to the "Bangalore radio" and also whether he had one! He said, "They air all my old discourses on it. I don't know from where they get it, but they put it. Bhajans also come always." 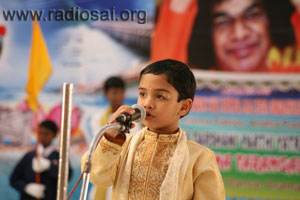 Looking at one of the students who is a singer, Swami said mischieviously, "Your wife sings songs there. Both of you can sing and give discourses. But what you talk between each other on the phone will not come there! That is a secret!" To Swami all of us are open books. The word "secret" loses its meaning when we are with Him. In the evening, there was a programme entitled "Krishna Tarangaalu"scheduled by the devotees of the Krishna district. 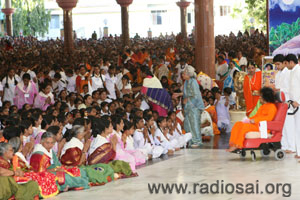 Swami arrived for darshan and as He moved through the ladies side, He noticed the large number of children seated there. He spoke to some of the ladies' coordinators and then He moved into the gents' side. However, something seemed to be 'bothering' Him if we may say so. He turned back and then asked for all the children to be seated in the path through which He arrives so that they would all be able to see the play well. He personally supervised the movement of the children into the path 'reserved for Him'. 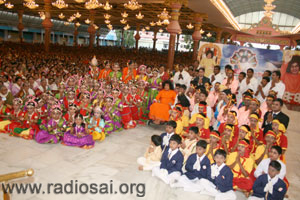 After being assured that all the children were seated properly, Swami moved to the stage and asked for the programme to begin. It began with the usual queues of florals, cards and offerings. The first part was a speech and this speech was rendered by a 4-5 year old! He flawlessly chanted a poem composed by Swami and then went on to speak with a professional flair with a sweet innocent accent and diction. When he said, "All the five elements reside in your hand", Swami raised His hand and showed it to him with a smile. Naturally people clapped in joy. 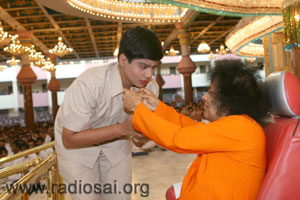 The boy received Swami's blessings and offered a rose also. The drama centred on a "worldly-foolish" person who stays back in his native village in Krishna district instead of going abroad and earning crores like his classmates. He opens an orphanage and spends his life and time in educating young minds about the glorious heritage of the land and inspiring them to be good people. A complex sequence of events take place wherein the mother of the concerned son also meets with an accident and the father with his other millionaire friends realizes that there are things in life more important than money. As the son speaks powerful dialogues replete with the wisdom that Swami has showered over the years, Swami was so moved and happy. In between the play itself, He called the good son and materialized a gold chain for him. Swami blesses the main actor in mid-performance! There is something so powerful in virtues and goodness - be it good thoughts or good words. These never become cliched and how many ever times they are delivered or rendered, just witnessing them is an inspiring experience. There were tears in the eyes of people as the nobility in the drama was witnessed. Good words and noble thoughts never become repetitive and that’s why every discourse that Swami gives, people listen to with renewed enthusiasm and new interest. And Swami encourages us to do that always - think good, speak good and do good. 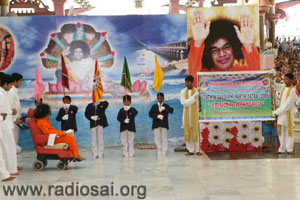 As all the children came together for the final formation, Swami blessed them and moved down to pose for photographs with them. He asked the little boy in front, his name. He made the photographers move to the left and right to ensure that everyone was covered. A shower of gifts followed next with Swami gifting sarees for the girls and white T shirts for the boys. The devotees started bhajans. After a while, Swami gifted two huge photographs that had been taken minutes before to the delighted group. Then receiving aarthi and blessing all with a two handed abhayahastha, Swami retired.